I got a phone call from a stranger. A pattern is emerging. This chap had been looking at the alloy wheeled T150 I had recently repaired, and that owner had given him my number as he wanted some work done on a T140D he had just bought. 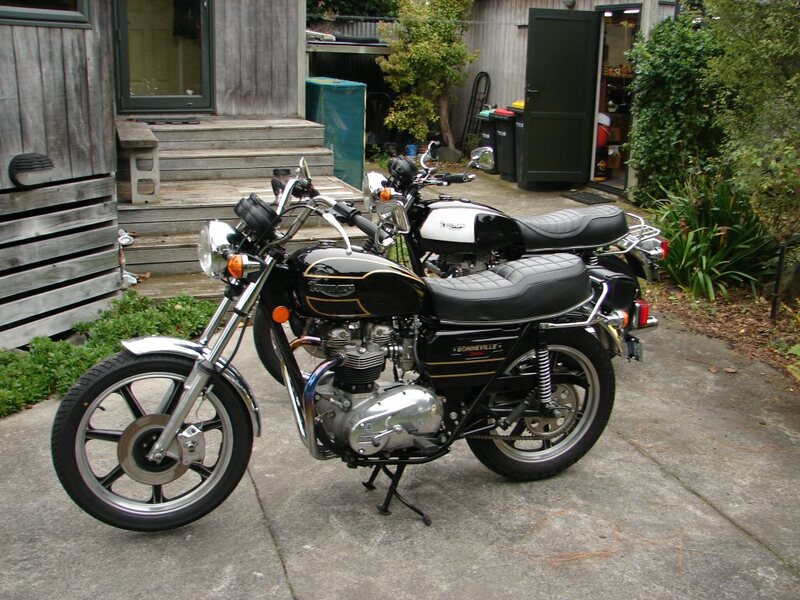 The bike had been in NZ for five years already, but had not been put on the road, so he wanted me to go through everything on it plus get it complied. It arrived a week later and was happily complete, but appeared to have been badly stored at some stage of its life. It was going to need a fair bit of effort. I love the look of them though. By that afternoon I had a lot of it apart. Front tyre was perished to hell, carbs were full of rust, quite a lot of damage to paint on the frame and swingarm which would need to be addressed in order not to raise the inspectors eyebrows, fuel taps were history, electrics were U/S although the seller had revealed that he had replaced the ignition switch and it had not gone well. Handlebars were loose, brakes were spongy, wiring had some obvious scars. As per usual, the further you go, the worse it gets. Fortunately it looked more like labour than lots of parts. I decided to be methodical and work from the front to the back. Front wheel came out first. 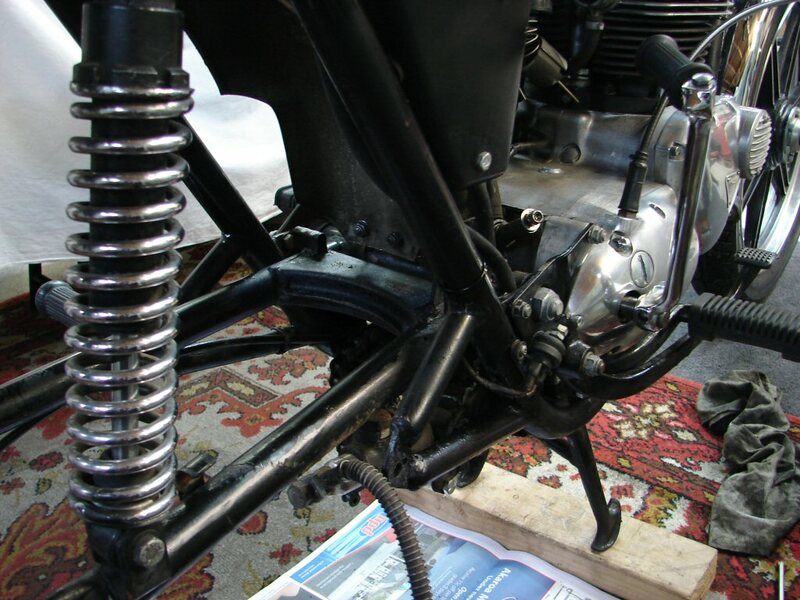 I then emptied the fork oils and bled the front brake, but the lever still felt below par, and I could feel that the lower fluid hose was quite soft and expanded noticeably when applying the brake. Top hose felt ok so I took a punt and only ordered the lower one. I treated the fork sliders to a polish and refilled the fork oil. I also refitted the handlebar clamps in the correct order and that eliminated all the play. The front wheel got a clean and a new Bridgestone, but in the process I spun the wheel and found that the bearings were shot, so it also got a new pair of bearings. Inside the carbs every orifice required cleaning, either with a drill bit, or a wire brush, or a jet cleaner, or a combination of all the above. Saddening to find a seemingly tidy bike in such a state, but further evidence of how quickly they go downhill when stored in the wrong conditions. Not attending to this would have caused endless problems in use. I believe this situation exists for a great number of imports that have simply been pressed into service without adequate preparation. Be warned. Play halted at this point while awaiting parts. 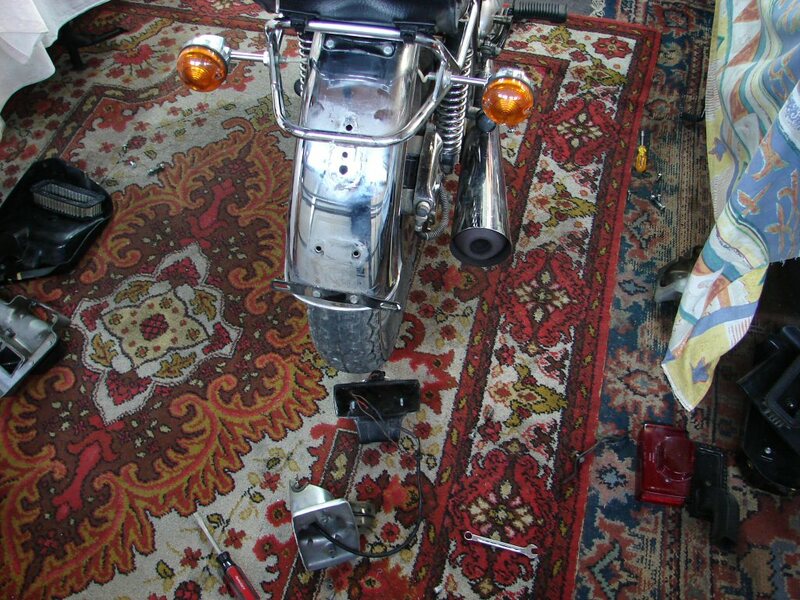 With the carbs stalled I gave my attention to the electrics. The ignition switch housing was removed as nothing much appeared to be working. The switch was also assembled with the spacer on the outside, so that needed to be refitted. I checked that all the contacts in the switch were working properly then assembled it in the housing using the T160 wiring diagram which appeared to be the same. 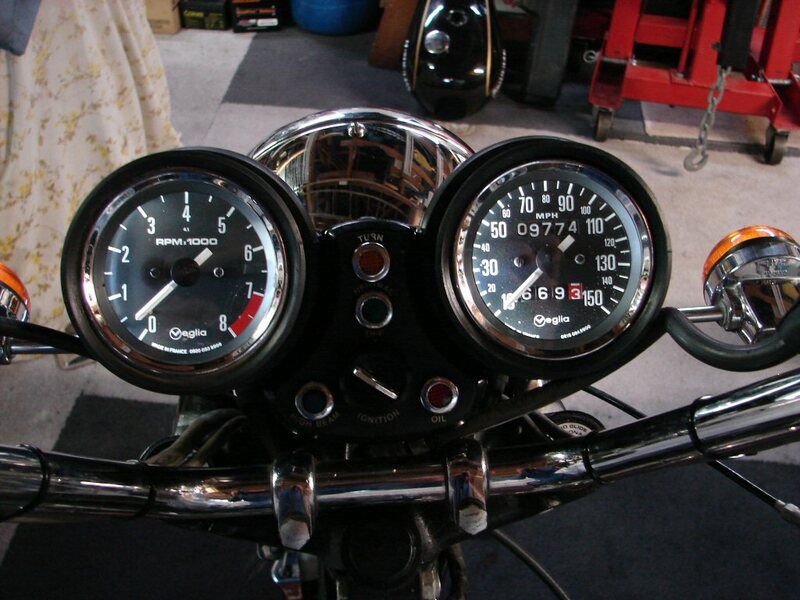 The panel light inside the speedo had failed so I replaced both with LEDs which make a huge improvement to the ease of reading the clocks at night. There were a few gremlins in the electrics otherwise, so several indicator lamps came apart, the headlight pilot light, the rear brake light switch and the tail light. The latter had to be completely stripped and a number of wires within it repaired. 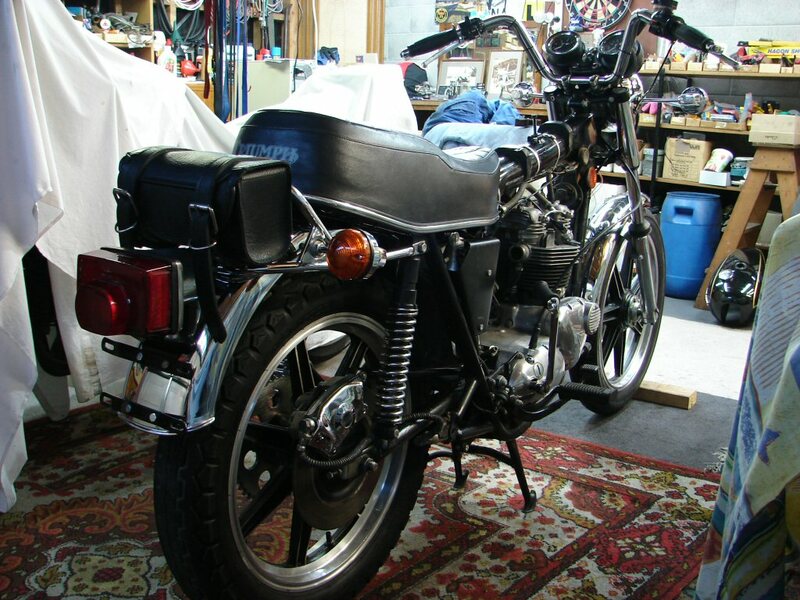 With all of those reassembled I now had everything electric working except the front brake light switch, which is a hydraulic unit and I had only received the new brake line this morning. I fitted the new line and took the old one to the rubbish to blow the fluid out of it, but could not blow through it at all. For the second time ever I have met a totally blocked brake line due to the internal rubber breaking down and gumming the works. I was now able to bleed the brake normally and found the brake light also worked. With the spark plugs removed I kicked the engine over until the oil light went out. I then waited for over 30 seconds before the oil light came on again, so things look pretty healthy in the bottom end. Final manoeuvre this day was to replace the kickstart cotter pin which was in trouble. The kickstart then got a new rubber as well, so a few visual improvements for a change. 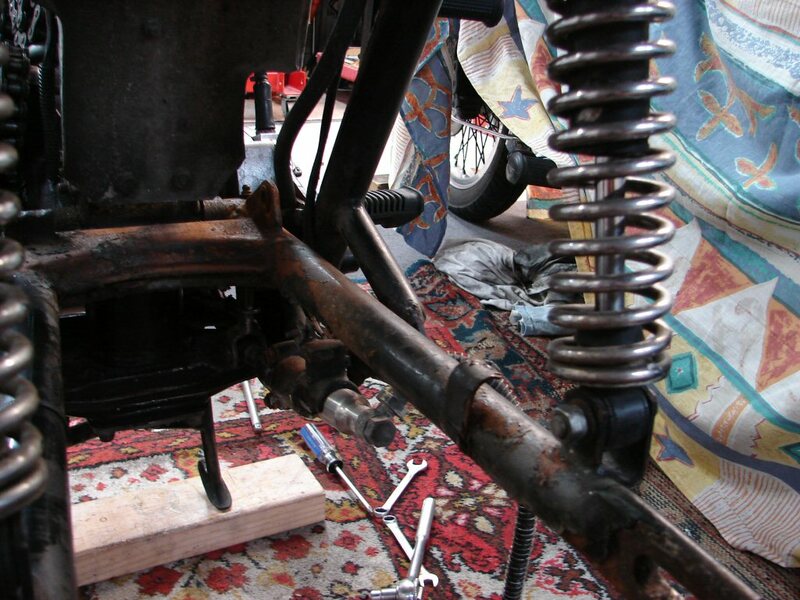 However, that was followed by the complete removal of the exhaust system, rear wheel, rear brake stay and various rear mudguard mountings in order to prepare the rust effected areas for some rust converter. This will not get a top coat but will leave a durable primer type finish, which is much better than rust. The frame will require a full strip and repaint to do a proper job, not my job right now. While only a stopgap measure, the overall effect is greatly improved, including sections of the lower rails beneath the right footrest. It certainly looks 100% improved in the flesh, and should serve the purpose of a clean pass in the compliance test. 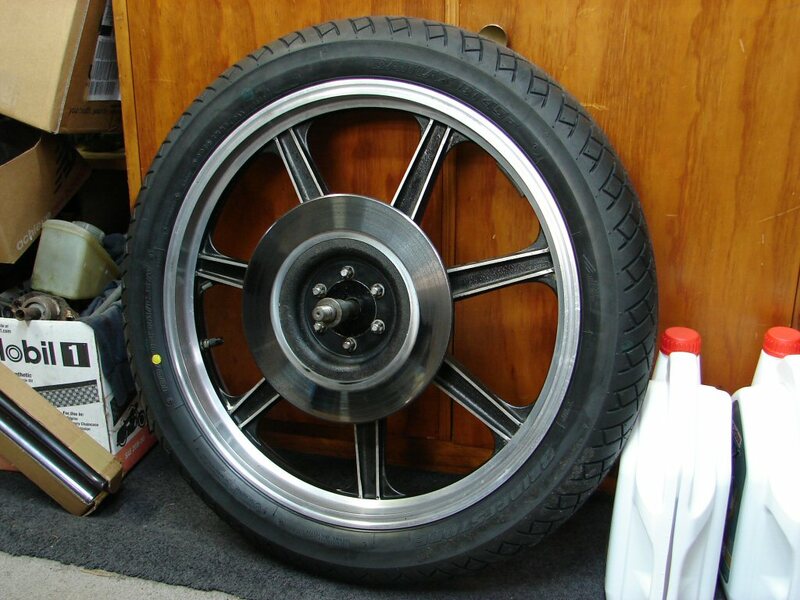 The rear wheel got stripped and cleaned, then all bolted back up with a completely repainted brake stay rod, as it was able to be completely removed. Chainguard remains off until the new chain arrives and is fitted. The seat lock was not operational when the bike arrived, and the seat catch was colliding with the rear brake fluid reservoir when closing. I managed to reshape the mounting for the reservoir which created a bit more clearance, and the fluid got flushed at the same time. I freed the rusted seat lock and secured it properly to the frame. As it now responded to the original ignition key I also repaired the catch beneath the seat and the whole thing is refitted and working as it should. Small win for a lot of time spent. Finally I decided to look for a spark at the plugs, being the only electrical thing not yet tested. Mysteriously there was not spark, yet the owner said he had heard it running. 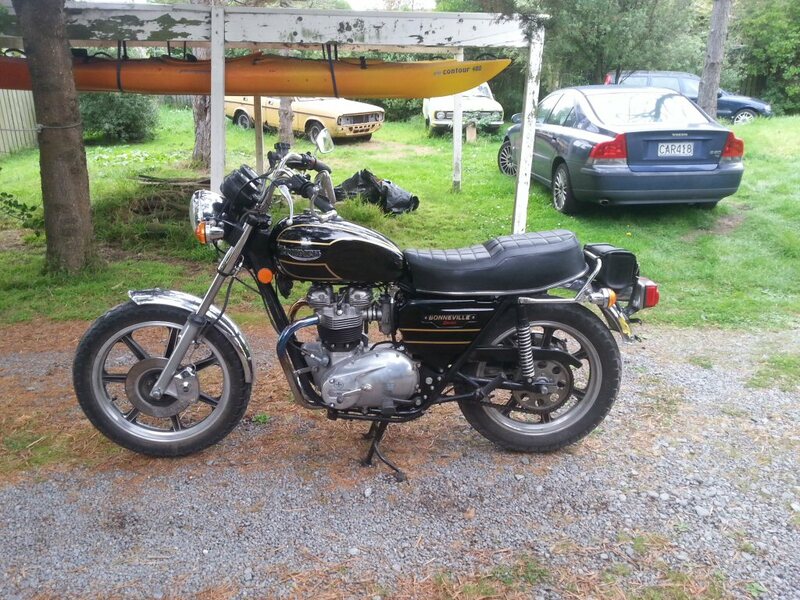 While checking I discovered that there was a spark when the headlight was turned on, and became suspicious that this bike may have had the "headlight always on" option which was invoked in North America around 1980. A look inside the headlight revealed that one white wire had been separated from the rest and included with blue lighting wires, and this was the feed to the killswitch. A very simple fix to move it back with the other ignition wires and job done. 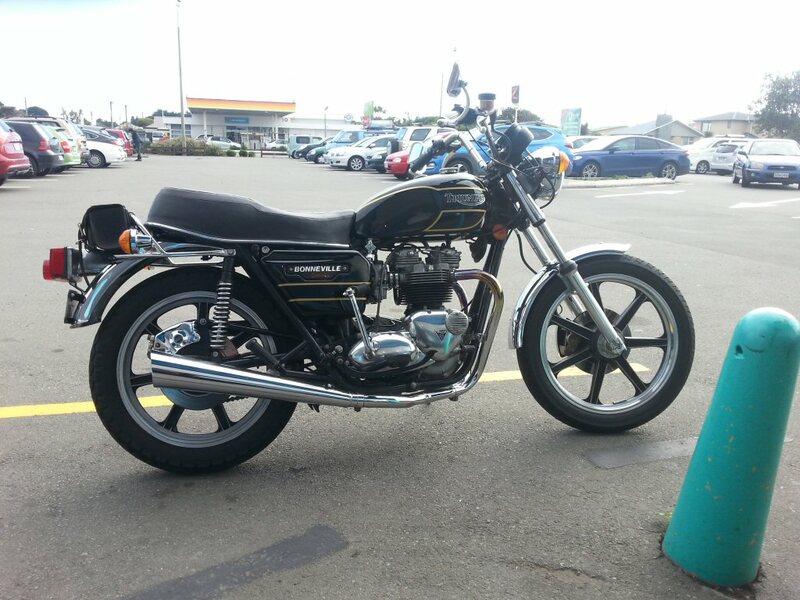 Whether this may have been a factory mod, or a dealer, or even a previous owner, is unclear, but as a 1979 model it certainly does not have to run with its headlight on in NZ. Most encouraging to have actually put some bits back on. All the oils were now drained and replaced. I flushed the frame oil tank a bit, but will do a second change after a brief amount of running. The filters were happily free of anything sinister but a tad grubby. All up, pretty good considering. 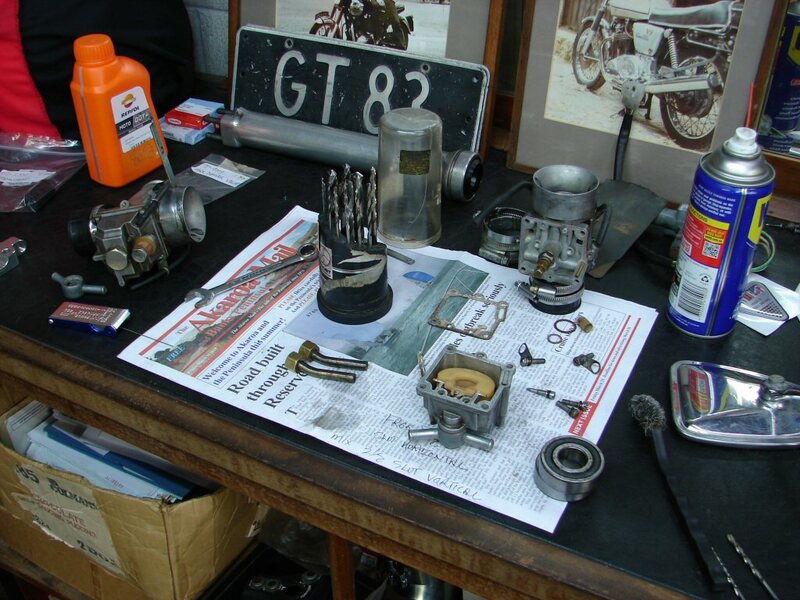 The carb kits arrived along with the new chain, so progress could be resumed. Both carbs got the full cleanup treatment, all the idle circuits checked clear and new gaskets, o rings and fibre washers. 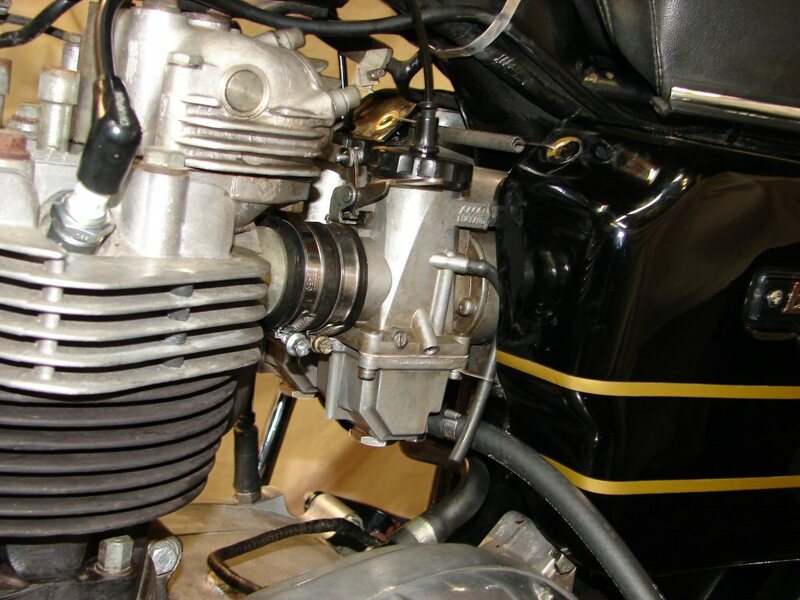 New fuel lines were made up and then the whole assembly was fitted to the bike, choke linkage fitted with new pins, and slides synched by eye. After that the airfilters and side panels were refitted, and finally the outer covers. The chain despite being the correct 106 links was a very tight fit and required the wheel to be absolutely as far forward as it would go. Going to get plenty life from this one. 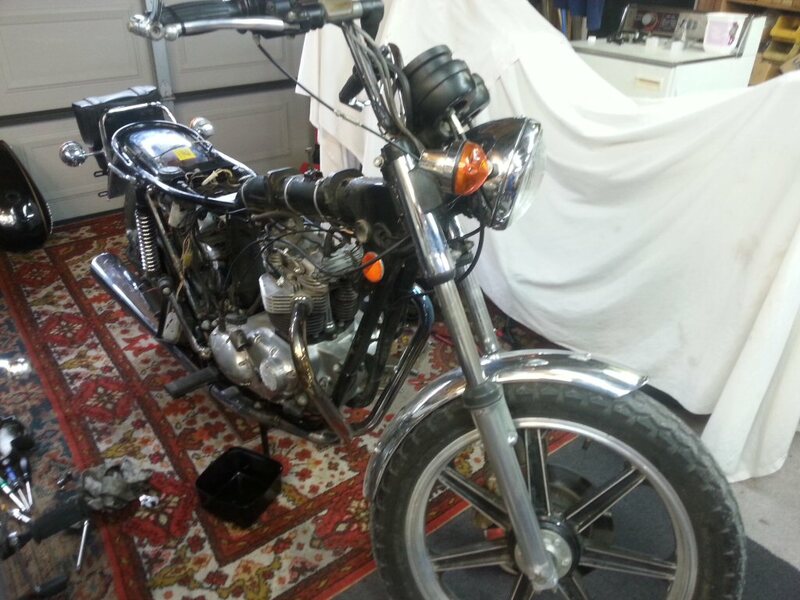 Final job was to clean up the exhaust system and the exhaust ports, and refit the whole thing. It all went together well and looks a tad more shiny than last week. Fuel tank went back on with new taps, and they mated up to the new lines happily enough. No leaks while sitting for 10 minutes with the taps on. Chokes on and a trial kick. Loads of compression here. Second kick and it fired up, ran for about 5 seconds and stopped. Tried again and same result. Pulled the plugs out and checked for a spark while kicking it over. No sparks. Turned the key off and on and sparks at both plugs. Suggests that the Lucas Rita ignition is not receiving pulses from the pickup, and as these are tiny pulses, and because the bike was badly stored, I figured bad connections would likely be the culprit. I found two sets of connections in the pickup loom, one under the fuel tank and one near the Rita unit under the right side panel. The tank pair looked good but got a clean anyway. The side panel two were a bit corroded but were also a loose fit when I put them back together. I fitted two new Lucas connectors and checked that I could read the pickup with a multimeter. That looked all good. 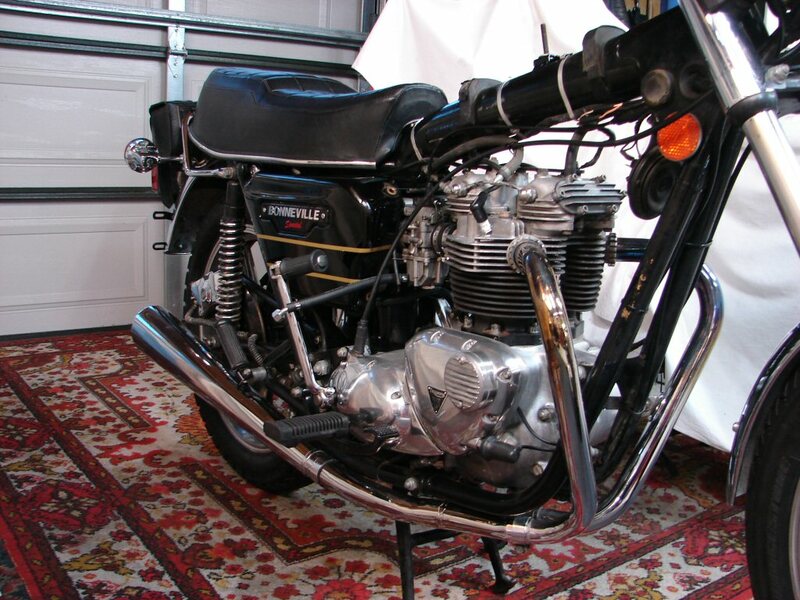 Bike started immediately and with a few tweaks of the pilot and idle screws settled to a steady idle, and also revved cleanly. After a brief warmup I removed one spark plug and set the idle speed on one cylinder. Reversed that situation and set the other, then refitted both and set idle again. Sweet. Just some chain lube to apply and we might be complete. Went back to the garage some hours later and smelled fuel. There was a slight weep from the threads of the right tap where it entered the tank. Removed it and added a smear of hermetite to the threads and tightened it all up again. Now we wait until morning..
.. and it is still oiltight. Only one thing to do then. 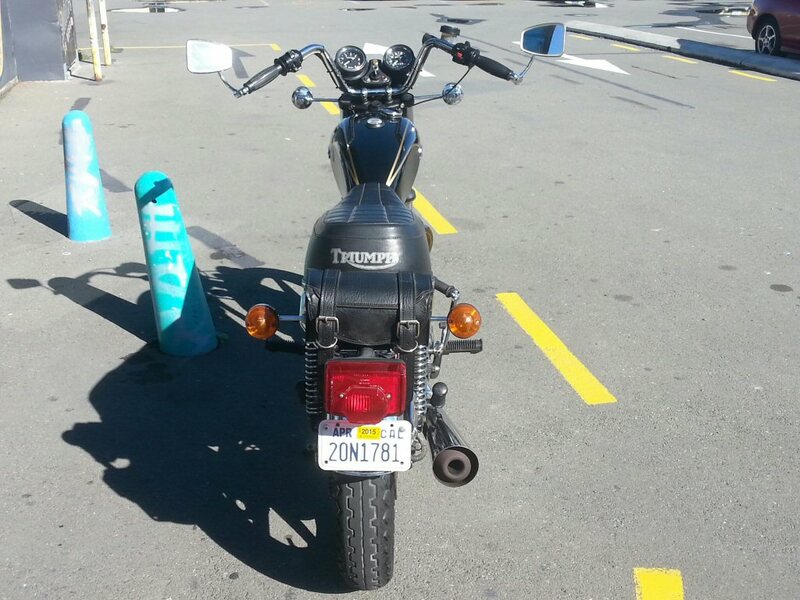 Attach a suitable Californian numberplate and ride down to the local coffee shop. I keep first rides very brief, as a lot can occur in a few miles. Good to contemplate your latest efforts over a fresh coffee. I always marvel at how slim the average Bonnie is. Unfortunately the US handlebars almost double the width, especially with bar end mirrors attached, but they were always one of the most agile of bikes with lack of extra frippery. The "Spesh" even more so really. The ride was uneventful and everything worked in the correct fashion, although the brakes were feeble. On the way back I kept the front brake on for several hundred metres while holding a fair bit of throttle at the same time. That got the disc and pads heated up a bit and braking improved a heap. Still room for further gains but that will respond to use. 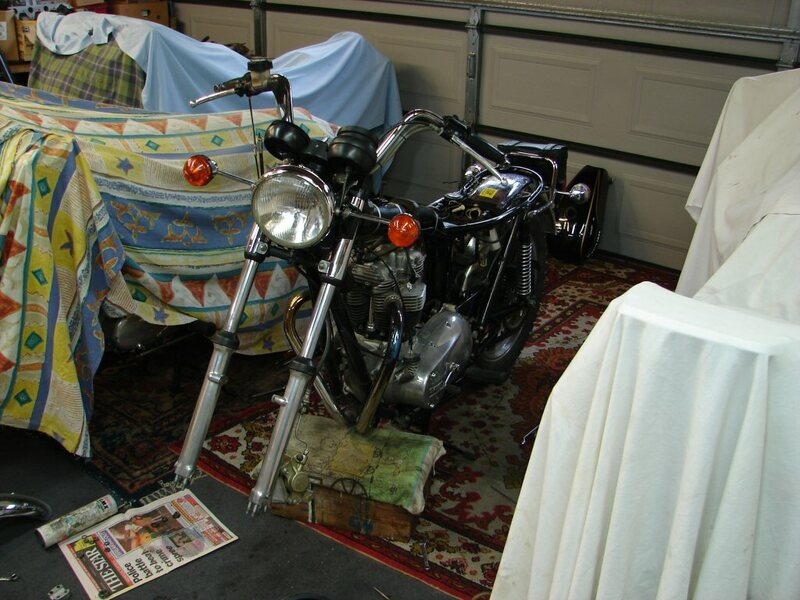 Next trick will be to get the bike complied, and after the next ride to dump all the oils and refill with new for the second time. That should get it to the point where regular change intervals can begin. 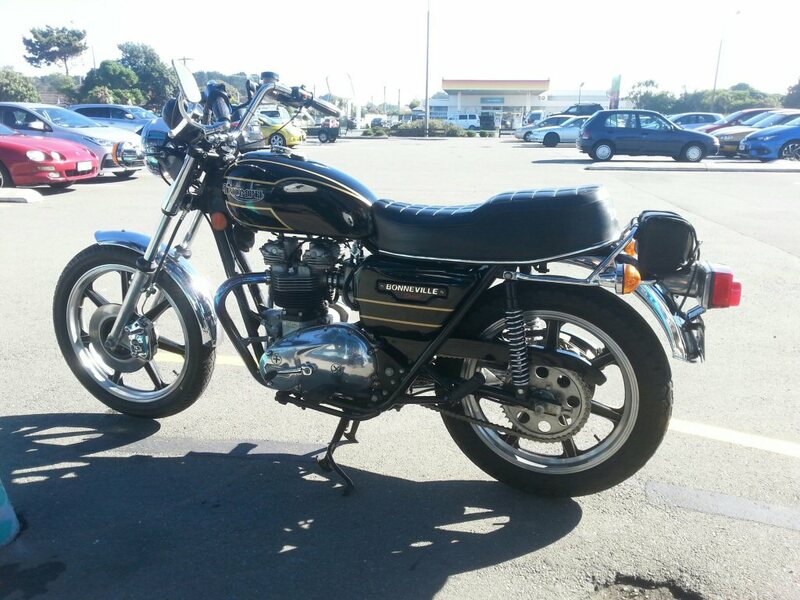 Meanwhile I would have to say that in my opinion this is one of the best looking bikes ever made in the 70s. The seat is a tad imposing, but as a production machine, it works well.